Brief introduction of products and options for virtualization. This article will focus on PC virtualization for common users (desktops) and will only mention virtualization for servers marginally. Based on practice, the Virtual PC program will be introduced. PC Virtualization is not a new thing. It was in use even in times of big mainframe computers, and since 2005, it has become very popular. Intel and AMD introduced HW support, Microsoft promotes its own products and wants virtualization to be used as much as possible. In order to strengthen the field of virtualization, Microsoft invested a considerable sum in the development, and moreover, acquired the Softricity company. Why PC Virtualization? I will describe its detailed features in this article. In simple words - using SW, a virtual HW interface can be created which enables to run multiple independent virtual interfaces within one physical interface. Apart from PC virtualization, there exist various products for virtualizing gaming platforms or virtual parts of a PC, e.g. well-known Virtual CD. Virtual CD/DVD drive - very popular. Using a specialized program (e.g. Daemon tools or Virtual CloneDrive), a virtual CD/DVD drive can be present in the system. Instead of inserting a CD, you just add an image file which has been created by a burning SW or some other way. The file does not need to be burnt to a CD, but can be stored within the network, disk or any other type of media. Using the image file, you gain a virtual CD with features the classical CD drive cannot offer. Its advantage is the speed and ease of storage. In Virtual PC 2004, you can start the virtual drive through the VM menu (CD - Capture ISO Image..). Unfortunately, only files up to the size of 2GB are supported. Virtual Machine (VM) - A virtual machine or PC is a virtual interface emulating (virtualizing) standard HW. You can install any operating system and use any programs and data files within the virtual interface. You can run multiple VMs parallelly on one physical PC. Each virtual PC appears as a stand-alone PC with an assigned part of RAM memory. All updates and changes are made independently. Host system - A system on which the virtual machines are running. ParaVirtualization - A technique of creating a special program interface (API) in order to utilize the physical HW, as particular VMs are not fully HW-emulated. In order to run under XEN using ParaVirtualization, the host OS needs to be modified. Your reward will be low requirements on system resources. Windows systems that cannot be modified, can be run on a PC with a CPU which supports Virtualization. Light virtualization - A combination of different forms of virtualization with as high performance as possible. Virtualization technologies in CPU - Along with new versions and CPUs coming to the market, virtualizion should get more support by virtualization technologies (Intel VT / codename Vanderpool and AMD Virtualization extensions / codename Pacifica alias SVM - Secure Virtual Machine). Virtual machine manager (or Hypervisor) - is a thin software layer between the virtual machine and host system. Depending on the SW virtualization technique, it emulates particular HW or utilizes various forms of virtualization. Recently, a new technique has been introduced - maximum utilization of the CPU support (some SW elements are removed and replaced or optimized by new features of the processor). Virtual server - Virtual server does not necessarily need to be another server OS installed in Virtual Machine. It is a name of multiple application servers parallelly running on one OS (WWW, FTP, ..). Licensing - Each installed virtual PC should have its own licence. Within Microsoft Dynamic Systems Initiative, the user should only pay for active software copies of network virtualization technologies (presspass). Licensing of the new Windows Vista could be a bit controversial, as only systems designed for businesses can be used as guest systems. OEM licences will not be allowed to be used in virtual interface and the FPP licence should only be run on one computer. When transferring an OS, the previous system should be removed. When transferring an OS to another user, this will be allowed to do only once and the new owner should not transfer the licence again. Ideal licensing for large companies is provided by Windows Vista Enterprise - up to 4 virtual Windows Vista Enterprise systems can be run. The licensing conditions can change anytime, and information mentioned here may not be valid in the future. The licence agreement gained upon purchase is essential. Virtual PC 2004 is a program by Microsoft enabling to run multiple Virtuals PCs on one physical PC. Theoretically, almost any OS designed for the X86 platform can be run under Virtual PC. In 2006, SP1 (5.3.582.27) version was released as free download. Other popular alternative software: VMware or Virtual Server 2005 R2 for servers (Compare with MS). Along with Windows Vista, new version 2007 should appear on the market. Virtual PC 2007 is a new version to be released in 2007. Now, in the third quarter of 2006, there exists the Beta1 (6.0.122.0) version. I put it through a short test while writing this article. Some differences may appear in the future. The appearance is the same as in the older version. From my point of view, the most important is the support of virtualization technologies in CPU, 64-bit interface support (16-bit OS can be run as well), support of larger *.ISO files and an innovated guide for adding new virtual machines to new OS. MS materials also mention optimization of Vista as a host OS (apart from others, support for rebuilt sound drivers for Windows Vista has been added) and improvement of performance using some improvements from Virtual Server 2005 R2. Emulated HW does not change, probably because of backward compatibility. When returning to VPC 2004, error messages about unknown VM configuration format were displayed, but apart from this, everything worked without problems. Officially supported systems in the 2007 version: MS-DOS®, Windows 98, Windows XP, OS/2, Windows NT, Windows Vista, Windows 2000, Windows 2003. Some are officially compatible, but not officially supported, e.g. DOS and Windows 98. System Center Virtual Machine Manager - A product for administration of virtualization centers using virtualization products by Microsoft, planned to be released in 2007 - Virtual Server 2005 R2 in Windows 2003 Server R2 and Windows Server virtualization in the new Windows Server codename Longhorn. Windows Hypervisor - Technology for virtualization in Windows Server Longhorn. It requires HW support of virtualization and enables to use up to 8 CPUs. Software Virtualization Solution - Product by Altiris. It enables running of particular applications and relating data in their own virtual interface called Virtual Software Packages. Two features are emphasized - elimination of conflicts and easy restoration of applications. Primarily designed for testers and programmers. XEN - Open Source application in Linux for running VM on a X86 platform. In 2006, the version 3.0 is coming - improved support for HW virtualization support and the option of running the Windows system as a VM. Together with ParaVirtualization, it offers higher performance of virtual machines for unbeatable price. Online migration to another PC is a very interesting feature, as well. Other popular SW, not only for Windows: Bochs, QEMU Simics, VMWare, OpenVZ, PearPC, TRANGO, Virtuozzo (more information at Wikipedia). Technical Support Employees - Easy and fast switching to the version of the operating system in which they need to find the solution of a problem, without the need of using another computer. Developers - fast testing of program functionality in different system versions. Common Users - Using of older applications which are not supported in the new system is highly appreciated by common users. Presentations - Presentations of program features in different interfaces and within networks consisting of multiple computers (presentations and training of network settings). Education - Using of virtual machine is more suitable for educating lessons (preparation of materials, teaching itself, demonstrations). Reinstalling the system before every lesson or complicated restorations have become a thing of the past. VHD - Virtual Hard Disk - You do not need a new disk partition to gain a virtual hard disk. In fact, the disk is a file (*.vhd) which, in addition, can be easily transferred between computers and backed up. Microsoft added another interesting feature - VHD can be used in both Virtual PC and Virtual Server. However, there also exists incompatibility, e.g. saved status files *.vsv do not work. Depending on the location of the *.vhd file, certain security components can be applied, such as encoding or access limitation for a specified group of users. Virtual HW - In virtual systems, the standard HW is emulated which differs from the real HW - it brings easy transferability and high compatibility. Its disadvantages are performance loss and some relating problems, e.g. USB devices requiring driver installation are not supported (usually the only working USB devices are mouse and keyboard). E.g. in Windows Vista, graphical card S3Trio is emulated, even though the real HW graphics is different. Stability - A failure of the virtual PC has no impact on other virtual PCs and the host system. Consolidation - enables to separate the physical and virtual HW. In case every department within a company needs its own server, it is advisable that they use virtualization technologies. Virtual Server 2005 is very popular regarding this purpose. Apart from higher security based on separation of servers, savings on HW and more effective utilization of the performance are taken into account, as the performance of today's servers is used only partially. If more servers are needed, it could be more effective to run them virtually on one HW. No restarts, no reinstallations - It is easy to test an OS without the need of reinstalling and restarting the system. You can run multiple systems without the need of dividing the disk and you can have the files of the virtual disks saved outside your computer which means you can copy the file after every change made to a desired location and anytime return the previous state. Performance - High requirements on HW performance. It may not be suitable for games and applications requiring graphical and disk performance. If you want to run Virtual machines parallelly, huge amount of RAM and powerful CPU may be required. For professional use of Virtual Server, it is recommended that you use multiple processors and save the virtual disk file to another physical disk than the Host OS. To improve the VM performance, you need to install Virtual Machine Additions to VM after having installed the OS (more information further down the page). Virtual PC emulates basic Hardware in the PC (processor is not emulated). For comparison, we mentioned detected HW in the real machine and emulated HW in the virtual machine. Its disadvantages can be performance loss and limitations in usage of some parts of HW. A big advantage is a high compatibility and other features provided by PC virtualization. USB devices for VM support are missing (a strong argument for using competition's VMWare). Virtual PC requires drivers for virtual HW - Many beginners of the Virtual PC incorrectly try to install drivers from the host system to the virtual machine. Only S3 emulated graphic card can be used. A floppy disk is required for the RIS service. PXE is not supported by emulated network card. In VM, you can set the RAM size and the size or number of virtual disks. The RAM size is strictly related to VM. If you run multiple VMs, you need a lot of memory for the physical PC. The basic console is designed for administration of particular VMs and provides access to further settings. Some values can only be set up if VM is not running or, contrariwise, only after the system has been started in VM. After having started the application, press the New button and choose one of the options in the wizard. The wizard also offers a detailed help. 1. 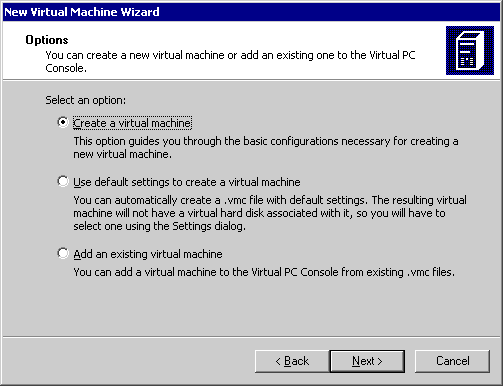 Create a virtual machine - This option guides you through the basic configurations necessary for creating a new virtual machine. 3. Add an existing virtual machine - You can add a virtual machine to the Virtual PC Console from existing *.vmc files. Virtual Machine Name and Location - Name and location of the *.vmc file. If you are happy with the default location in the folder Documents \ My Virtual Machines folder, just enter a desired name. If you want to change the folder, you need to use the "Browse.." button and find the desired location. Traditionally, the name is the same as the name of the OS running in the particular virtual machine. E.g. I chose g:\virtual\dos.vmc. Important: The default location is not chosen and recommended randomly without any purpose. The reason why it is located in the My Virtual Machine of the actual user is security and limitation of access to the virtual disk for other users. Operating System - You can choose which system to install. According to the chosen system, default settings for operating memory and virtual disk size will be selected. To apply your own settings, choose Other. The list of products only contains systems supported by MS, however, you can install almost any OS designed for the X86 platform, e.g. Linux. Memory - You can choose the recommended amount of memory according to the selected operating system or you can set your own size. The necessary amount of memory is derived from the requirements of the host system. Each virtual machine takes its necessary amount + some part of the memory is needed for the host OS. Virtual Hard Disk Options - You can choose the existing virtual disk (*.vhd) or create a new one. Virtual Hard Disk Location - The same way as for the *.vmc file, you have to choose the name and location for the virtual disk, in this case g:\virtual\doshd.vhd. In order to choose detailed settings for the new disk, it is recommended that you start the wizard for virtual disks. (File - Virtual Disk Wizard). Installation will be executed either by installation of an OS or by copying the existing virtual disk containing an installed system. After the virtual PC is created, it will automatically be displayed in the list. Virtual PC creates a dynamically expanding disk, and therefore offers the option to expand the virtual disk up to the full capacity of the disk partition. Dynamically expanding - The disk size adapts to the maximum data size stored on the disk. The size will not reduce (will not adapt) when data is removed. In such case, its editing must be executed. Its advantage is saving of space. If you are not sure what part of the size of the disk you will really use, you can choose the maximum size of the space on the disk in the host system upon its creation and following formatting, but the real size of the file will be based on the real data amount. Fixed size - File with the virtual disk having fixed size. The size of the file and the size of the disk are the same. Differencing disk - is related to the existing disk. All changes are saved to the differencing disk. Linked to a hard disk - links to the physical disk in your computer. This is only recommended for experienced users, as you can loose data. It is recommended that you use a disk with no data. Upon installation, it is necessary to divide disks and format them the same way as in new disks in the host system. You can add 3 virtual disks to a VM and you can work with them as in the particular OS. Virtual PC behaves the same way as the classical PC, however, everything is happening in one screen while switching between virtual and real PC. 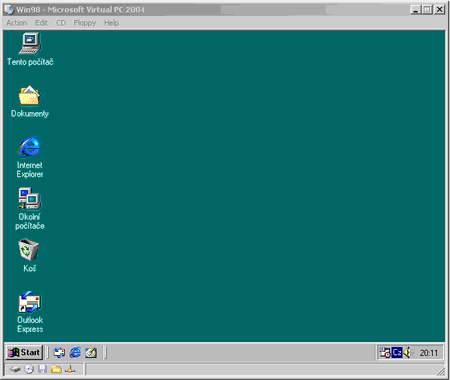 After having started Virtual PC, a screen displaying the virtual interface is opened. Upon the first start of the application, you have to define from which drive you want to start the installation of the system. Everything else is the same as when installing system on a classical PC. 1. Start the installation from CD or CD image. 2. Installation starts, virtual disk is being prepared and formatted. 3. Let the installation run and finish. If you do not want to use the DVD drive and you want to use an *.iso file with the "Capture ISO Image..." feature, you will be disappointed. Virtual PC cannot read *.iso files larger than 2GB. Alternatively, you can use the virtual CD drive in the system, e.g. daemon tools. One of the improvements of the 2007 version is the ability of reading large *.iso files. In order to install another system, you should look in the manual. In some cases, it may not be able to run the system on the emulated HW. Microsoft officially supports only systems listed in the wizard. Security - For both the host and the guest system, the same security rules should be kept, e.g. using NTFS file system, antivirus and firewall on both systems, keeping Windows updated. In an interface in which you want to disable changes of VirtualPC settings, you can set to require administrator permissions (Menu: File - Options - Security). In order to protect the access to Virtual PC, you can set Windows or BIOS password for the VM. Attention! The password is saved as a part of the VM settings and can be bypassed by creating new VM configuration and connecting the existing virtual HDD. 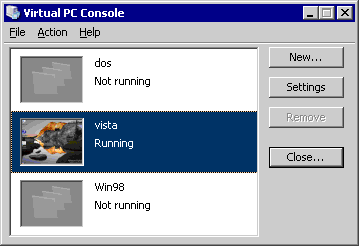 Vista as host OS - The 2007 version is optimized for Vista. It is recommended that you also use the HW support in new processors. The weak point is the need of setting RAM - 512MB RAM for Vista and 64MB for Virtual PC. Floppy Disk Settings - options for virtual floppy disks. CD/DVD Drive Settings - 1. Capture Iso Image - you can use an ISO image which then appears as a Virtual CD drive. 2. Release - disconnection of the physical drive or ISO image. 3. Use Physical Drive - According to the total number of drives, you can choose which one will be active, there can also be only one. 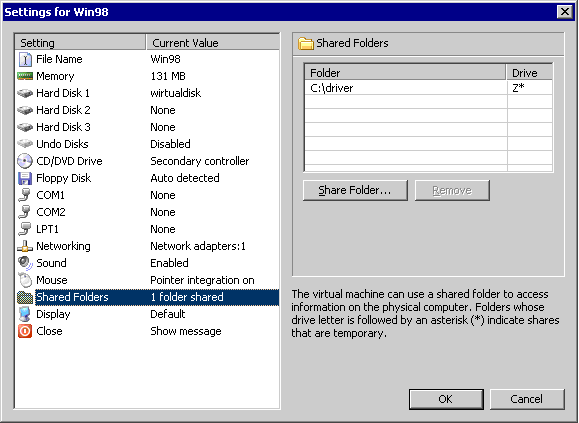 Shared Folder - Shared folders allow you to transfer files between the virtual disk in VM and the disk on the host PC. If this is not supported, you can use network disks, FTP or similar network devices. There are few different modes for setting the network. Not connected - the network card appears as if the cable was disconnected. Local only - Option for creating network between virtual machines. Network resources of the host machine or the physical network will not be available. 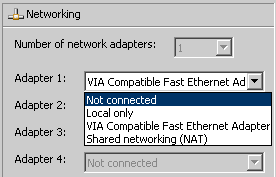 Via Compatible Fast Ethernet Adapter (Network adapter on the physical computer) - Name of the adapter of the host computer. VM will be, after having been correctly set up, connected to the physical network. Be careful about the security. VM can be seen and endangered as any other PC in the network. Shared networking (NAT) - special type of connection. The host computer behaves as Router + NAT and an IP address is automatically assigned to the VM for internet connection. Virtual PC is not available from other computers. This option is recommended for unsecured computers or before the installation of updates and applying other security features. Here you can change settings for performance, security, keyboard, mouse and some others. Virtual machine configuration (.vmc) files - Configuration files in the XML format. Virtual hard disk (.vhd) files - File with the virtual hard disk. It contains the OS itself, applications and data. The saved-state (.vsv) files - Files with saved OS status. Similar to sleep mode. Undo disk (.vud) - Using the Undo disk you can save all changes made in the system to this special disk, and if necessary, delete or apply them in the main virtual disk at any later date. By installing the VM additions to the guest OS, you gain certain improvements - usually higher performance, support for the whole system operation in the virtual interface, time synchronization and additional features for administration. Shared folder for transferring and copying between the host and the guest PC is also an important feature. When transferring from VirtualPC 2004 to Virtual Server, Virtual Machine Additions should be reinstalled. 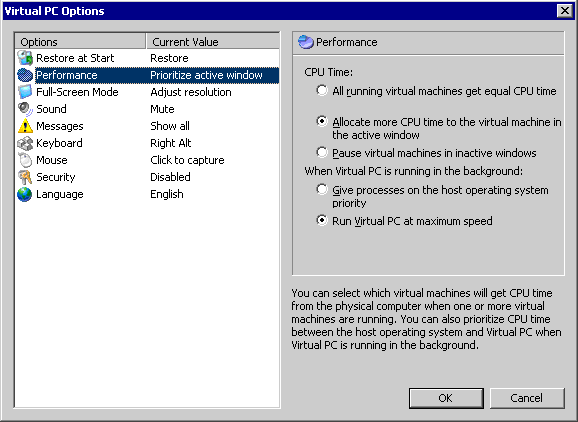 New Virtual Machine Additions from the new Virtual Server 2005 can also be used in Virtual PC 2004. In the computer with Virtual Server 2005 find the VMAdditions.iso file (usually in the directory C:\Program Files\Microsoft Virtual Server\Virtual Machine Additions). In VM to which you want to install Virtual Machine Additions, add the VMAdditions.iso file as a CD Drive (menu - Capture ISO Image..). In some cases, this may not work correctly and then it is more suitable to reinstall VMAdditions with extensions in the running Virtual PC or Virtual Server. When transferring systems to a different virtual interface, they should be turned off and the saved states in *.sav files should not be transferred. If you sat someone in front of a VM in full screen mode, he/she would probably not recognize that it is a virtual PC. Installation and working with the system is the same as in real systems, apart from some shortcuts and limitations. Host key (Right Alt) - a special function key. If the Virtual Machine Additions are not installed, this shortcut switches between the host PC and VM interfaces. Host Key + F4 - Close..
A VM PC can be transferred to another real computer using the Ghost program. Be aware of HW conflicts of the new HW. System restore can be used, as well, however, I recommend that you do not do it. You can change the MAC address in VM by deleting the value <ethernet_card_address> in the *.vmc file.